I took a brief trip back to the Quad Cities for Christmas. What? You don't know where that is? Don't worry. It's on the border of Illinois and Iowa and has two cities on either side of the Mississippi River. Moline & Rock Island in Illinois. Bettendorf & Davenport in Iowa. Christmas took me back to the Quad Cities. I haven't spent much time there since I moved to Colorado. Mom and I spend time together all over the world. We just don't spend our time together in Moline. 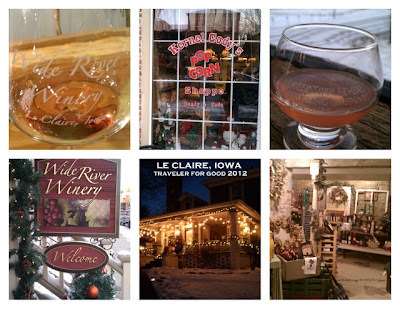 The traveler in Mom matches the traveler in me and so she took us to explore Le Claire, Iowa. Le Claire has a cute little main street with restaurants and shops - most of them have an unobstructed view of the river. These were my favorite places we visited in Le Claire. They are all featured in the collage above. Our family can't resist a wine tasting. A little sip of Ms. Chevious? Don't mind if I do. Especially at Christmas, it's impossible to pass up the smell of fresh popcorn. Chocolate and Peanut Butter was my pick of the day. Yeah....just like we can't resist wine. They had some special coffee liquor and strawberry vodka. Later on, Mom and I doctored our eggnog with their Cody Road. I also learned about the existence of Benny's Bloody Mary Beef Straws. Who knew? A fun and eclectic shop in an old house. Every room was different. The basement? A giant wine cellar with all kinds of gifts and goodies. I got to snuggle with their golden retriever (I think her name is Lily). Their previous golden retriever, Brady, got to meet President Obama in 2011 when he came through Le Claire. Their family even wrote a book about it called Brady Meets the President. I think this is where the Antique Archaelogy store is - they have a show on the History channel called American Pickers. Danny and I are planning to stop there this fall en route to Madison for the Iron Man! I will have to keep this post to check out the other places there too. Show Iowa some love when you drive to Wisconsin!